This entry was posted in Civilizations unraveling, Dark Ages, Earth Changes, Earth Watch, Environmental Threat, Time - Event Acceleration, Unsolved Mystery, Water Crisis - Conflict. Bookmark the permalink. I did a generic search for the term “Lake turns red” and blocked off for the first 9 months of this year (2012). That search returned about 2,600,000 results, same time period last year (2011) 985,000, (2010) 239,000, (2009) 150,000, (2008) 102,000, (2007) 62,900, (2006) 42,600, (2005) 25,900, (2004) 18,500, (2003) 15,200 (2002) 19,300. Now as with all searches, the results did not always relate to bodies of water turning red, but if you try this and scan through the first page I think it is pretty evident that back in 2002 up until say 2006 it was very uncommon for water to turn red, the last 2 or 3 years happens all the time. I also looked at a graph of percentage of internet users from 2002 to 2012, thinking maybe there are just that many more people posting articles about this now. No luck. To get to an average of say 19000 articles in 2002 to 2,600,000 in 2012 you would need about 136 times more users now than in 2002. 600 million people were already online in 2002. You would need more than 80 billion users now (about 13 times the population of the planet) to account for this increase. Proves to me I’m not going crazy and this is not normal. I remember thinking when I was young that if the lakes and rivers turned to blood I’d know we were in the end times, and I used to wonder why people would continue to fight against god during the last days when all these weird things would be happening. I guess its like turning the heat up slow on the frog. People become normalized pretty rapidly. People keep sleeping on the signs of the great coming. I’m not sleeping at all…..
Industrial waste up river that some company or even the government has chosen to hide from the public… or not. China has different laws and permissions than the U.S. and is also the biggest industrial nation these days. This above scenario would not surprise me… I think that this has happened before, either on this river or one of the other rivers that are in China… Other than that, this may be sediment from a volcano or the result of an earthquake or some other environmental occurance happening out in the country… although a volcano or earthquake would necessarily be noticed more than …. say an oozing of some sort from earth sciences into the river. Those are my thoughts on it.. from conjecture. I said bacteria in my previous post, but it may very well be algae. youare the only one that has nailed it. It was on National Geographic about areas full of shell fish and how they process their food. IT is some sort of algea that is over running the water because they are not being consumed. PArt of the show I am not totally clear on the verbage my husband outtalks me and the television. I missed the details, but bottom line it is totally normal and can change when in balance. As far as end of the world signs. The prophets still can describe their gifts of future things as blood. I would say that too if I was from there time. Was National Geographic talking about “freshwater” or “saltwater”? It’s just dye from industrial waste, probably. Not that industrial waste is a good thing in a river. I watch these announcements. and KNOW in my heart they are warning signs ALVIN – thank you so much for posting them. Those who sleep – like those with the oil lamps, will miss these signs and miss out when Our Bride Groom arrives. I don’t understand the posts to explain it away by saying its iron or chemicals, etc….why? Does that river not look like blood? Does it matter how it happened? The fact that a river that huge looks like blood seems like a wake-up call to me. I feel the same way nonnie. Yes, warning signs, of which there have been many! Thanks for keep us updated Alvin. In my house, we are looking up. God bless. Yes, iamnotashamedofthegospelofChrist, many warning signs, and good that you got your family ready, as should everyone. We, as Christ’s followers, must bear in mind that not everything that happens is a warning sign.And be careful! If we tell everyone that the end times are upon us when they aren’t, it could lead others or even ourselves away from Christ! Additionally, we need to be constantly ready for Him, regardless whether we actually see the signs or not. I do agree that this sounds very much like the waters turning to blood like it talks about in Revelations. But it is still too early to tell. If we see more of this happening worldwide… then we’ll know. The waters will turn to blood, Alvin, something interesting that i researched, look up how sunspot activity affects water on a molecular level. Very interesting, also proof to john 1:1 equals cymatics. Hope you enjoy, shelly from texas. God is amazing, im getting less and less afraid of the horizon by becoming prepared and both enlightened, with your help also! The world is so much more advanced and is accelerating in knowledge, yet they cannot explain this. I love it. Look to God who knows everything and made everything. I agree! It’s amazing how much they know, but when something happens, no one has an answer. I also agree, we need to look to God! Test the waters in the river…see if it’s blood…my guess would be ~ YES!! I wouldn’t be surprised either Tracye. Even if the government tests it and finds that it’s blood, they may not tell the people, because of the fear of the outcome, seriously! Many would take their money from the bank, many may do foolish things, and the best part of all is that many would come to the Lord and seek out the God that created them before it’s too late and the door is shut. The signs are here for sure, not just water turning to blood, but earth that is going to be shaken out of it’s place as it says in Isaiah 24:18-20, and Isaiah 2:19-21. They wouldn’t tell anyone if it was blood. The only reason it’s on the news is because so many people saw it. There are all kinds of things that go on in small towns and large towns, all over but especially in China that you don’t hear about much on television if at all because people don’t want you to know what is going on. There are a bunch of vipers trying to cover up the truth. The Lord will be back soon. Hmm…kinda looks like the Nile about 3,400 years ago, doesn’t it? AMEN to that davidgreybeard, yes it does! Good catch with that statement. That is what the Nile probably looked liked. There is nothing mysterious about this.. the Yangtze and other Chinese rivers have been plagued with Acid Mine Drainage from China’s massive coal mining operations. If you live in coal country (USA) like I do, this is something you see.. the creeks run red! AMD water has a pH similar to lemon juice and is created when iron-sulfide rocks are oxidized by water and oxygen. In addition to its acidity, the water carries toxic heavy metals such as Arsenic, Cadmium, Lead and Mercury. The point here is made quite succinctly in The Extinction Protocol.. that we humans are running out of fresh water. Water is life.. and there are 7 billion people on this planet. A large percentage of those people drink water that is polluted with human waste, heavy metals, chemical waste and pathogens. Oh, and things are NOT gonna be getting any better any time soon! At present, 300 million Chinese do not have access to drinkable water, as heavy pollution compounds water scarcity problems. China faces “a water crisis more severe and urgent than any other country in the world,” Qiu Baoxing, vice-minister of construction, said last year. Hmmm… God will deliver us. QUIT LOOKN FOR A SCIENTIFIC EXPLANATION!! THE BIBLE WAS WRITTEN A LONG TIME AGO & PREDICTED THIS!!! RESEARCH IT ALL YOU WANT,SCIENTIST WILL FOREVER BE DUMBFOUNDED!!!!!! OR BE DUMB AND FALL FOR WHATEVER THEY DECIDE TO MAKE UP AND TELL YOU! QUIT LOOKN FOR A RELIGIOUS EXPLANATION!! … it is what it is, or what you want it to be, as people with their minds made up will need no explanation they just believe. Others will not and will look at all the possibilities, trying to find a reason is a totally natural thing to do and if it is from pollution thats not trying to explain it via science.. I kind of have problems to undertand this God, the same that lets people, kids included die in Africa from diseases and famine, people who have no means to defend themselves. Ah ok I see, they will be given a place and heaven and forget all the pain all of a sudden. This world that I live in, is full of crazy people. The pain and suffering experienced by all of humanity, even the children, is the result of our own rebelling by allowing our selves to be seduced into bringing sin into what was once a perfect system. Just as cancer is a disease of the body, avarice and greed and violence are diseases of the soul, and nearly every calamity that befalls us can be traced to those flaws in one way or another. We live in a grievously flawed world, and until God “pushes reset” at the Great Resurrection this world will remain flawed. “כל מכות שהביא הקדוש ברוך הוא על המצריים במצרים הוא עתיד להביא על מלכות הרשעה, שנאמר (ישעיה כג): “כאשר שמע למצרים יחילו כשמע צֹר”. אמר רבי אלעזר: כל מקום שכתוב צור מלא (עם ו’) בצור המדינה הכתוב מדבר, וכל מקום שכתוב צר חסר (עם חולם חסר) במלכות הרשעה הכתוב מדבר, שהיא מצירה לישראל. במצרים הכה בדם, במלכות הרשעה: “ונתתי מופתים בשמים ובארץ דם ואש … השמש יהפך לחשך והירח לדם” (יואל ג). במצרים צפרדעים, שהיה קולן קשה, ובמלכות הרשעה: “קול שאון מעיר, קול מהיכל” (ישעיה סו). במצרים כנים: “והך את עפר הארץ”. ובמלכות הרשעה: “ונהפכו נחליה לזפת, ועפרה לגופרית” (שם לד). במצרים ערוב, ובמלכות הרשעה: “וירשוה קאת וקיפוד וינשוף ועורב ישכנו בה” (שם). במצרים דבר, ובמלכות הרשעה: “ונשפטתי איתו בדבר ובדם” (יחזקאל לח). במצרים שחין, ובמלכות הרשעה: “המק בשרו והוא עומד על רגליו, ועיניו תימקנה בחוריהן, ולשונו תימק בפיהם” (זכריה יד). במצרים ברד, ובמלכות הרשעה: “וגשם שוטף ואבני אלגביש” (יחזקאל לח). במצרים ארבה, ובמלכות הרשעה: “בן אדם, אמור לציפור כל כנף, ולכל חית השדה: היקבצו” (שם לט). רבי אבא בר כהנא אמר: חושך ואפילה שימשו במצרים, אבל תוהו ובוהו לא שמשו בעולם הזה, ולא עתידין לשמש. והיכן עתידין לשמש? בכרך גדול שברומי, שנאמר: “ונטה עליה קו תוהו, ואבני בוהו” (שם). ורבנן אמרי: אומות העולם שלא קיבלו את התורה שניתנה מתוך החושך, עליהם הוא אומר (ישעיה ס): “כי הנה החושך יכסה ארץ, וערפל לאומים”, אבל ישראל: “ועליך יזרח ה’, וכבודו עליך יראה” (שם). במצרים פרע מאליליהם ואח”כ פרע מהם, ובמלכות הרשעה פורע מן השר שלהם תחילה, ואח”כ מהם שנאמר (ישעיה כח): “והיה ביום ההוא יפקוד ה’ על צבא המרום במרום ועל מלכי האדמה באדמה”. Rabbi Elazar said: Every place says Full Contact (with W) Tyre state Scripture speaks, and that says sorry missing (with dreaming missing) Kingdom of conviction Scripture speaks, she regrets Israel. Egypt beat blood, evil kingdom, “and I wonders in heaven and earth blood and fire … the sun will turn darkness and the moon to blood” (Joel C.). Egypt frogs, which sound difficult, and the kingdom of evil “remarks of noise, the sound of the Hall” (Isaiah Sue). Egypt honest: “twentieth the dust of the earth.” And the kingdom of evil, “and became rivers of tar and sulfur ore” (where Led). Egypt blending, and the kingdom of evil, “and allowed Kath and hedgehog, an owl and a crow inhabit it” (ibid.). Egypt thing, and the kingdom of evil, “and I served with him on and blood” (Ezekiel wet). Egypt boils, and the kingdom of evil: “Mac flesh and he’s on his feet, his infants to their sockets, and his tongue infants to their mouth” (Zechariah hand). Egypt hail, and the kingdom of evil, “and rain stones and crystal” (Ezekiel wet). Egyptian locusts, and the kingdom of evil: “Man, should the bird every wing, and to every beast of the field: Cluster” (where LT). Rabbi Abba bar Kahana said: darkness and gloom were used in Egypt, but the chaos is not served in this world, and our future be used. And where our future be? Roman large volume, it says, “a line inclined chaos, and chaos stones” (ibid.). And Rabbis said: Gentiles who received the Torah was given through the darkness, which he says (Isaiah’s): “For behold darkness shall cover the earth, and a mist nationalities”, but Israel: “and you will shine God, and honor you will see” (ibid.). Not to be rude to those that say the bible has all the answers,and science is dumb,but think of the rainbow.Bible says it’s God way of letting us know he will never flood the earth again.Science proves it is from the sunlight shining thru water droplets in the air.As to living your life the way the bible instructs,the old laws were never changed by Christ,he came to live them,not change them.His words,not mine.How many are living by those laws?How many make up reasons to not live by those laws?We can’t pick and choose,it’s all or nothing.Not to offend anyone,but my view on religion and myth is myth is obsolete religion.Just as the bible prophesies the end times,so do a lot of the old religions(myths). Most all of the old religions prophesy the end times, and the degree of concurrence among them all is quite remarkable. The rainbow was chosen to be God’s sign that He would not destroy the world by water again, which fact doesn’t eliminate the scientific explanation of why a rainbow looks the way that it does. Science is able to describe the mechanics of the universe but even the scientists admit they can’t explain the why without getting into vague and meaningless theories; what caused the Big Bang, for instance? But when Christ came here the first time He said that He came to fulfill the Law, not uphold it; by fulfilling the requirements of the Law we were freed from it and have since lived under Grace. If some people choose to abuse that privilege then they will answer to God for that, so it then becomes a question of affecting one’s position in the Kingdom to come. Faith in Christ is what matters. David, that was deep. Bless u brother!!! Jesus said in Mat 5:16 “Let your light so shine before men, that they may see your good works, and glorify your Father which is in heaven. Mat 5:18 For truly I say to you, Till heaven and earth pass, not one stroke or one pronunciation mark shall in no wise pass from the law, till all be fulfilled. Seems to me that heaven and earth are still around and so the commandments still stand. You bring up a fine point, amyp, and thank you for the actual reference and quote. By fulfilling the Law of Moses, Christ bought the exemption from it that is necessary for salvation. Paul brings this up a couple of times at least, once in Romans 7:7-8:4 and again in Galatians 3:10-25 that the Law was given to illustrate exactly what sin was and that no one can observe all of the Law. Redemption is through faith in Jesus, and faith alone; that is the very essence of Grace. You are right, the Law hasn’t been destroyed, for it still condemns sin each and every day and always will, but those who place their faith in Christ and his sacrifice are saved by that sacrifice, and the Law no longer has a hold on them. Peace and blessings to you. Well, I have agreed with Alvin not to go into theology on this site. It is off subject of the matter discussed here. BUT, I have to disagree with your interpretation of grace. The flaw is that practicing God’s laws bring blessing to life, and as I study it, Jesus’ sacrifice was to free us from the penalty of intentionaly breaking of the Laws of God. There never was a levitical sacrifice for intentional breaking of the Laws of God. If even the demons believed that Jesus was Messiah, belief only would be accounted to them. It is by belief in Messiah first and with belief, God’s laws are then written on your heart and you will want to serve Him in love. Walking in that path, you are letting your light shine before men, and they see something different about you. That is about all I will say here. I see your point and understand where you are coming from and wish blessings to you. Heck yeah, I agree. People always want a scientific explanation on everything. Why can’t we just believe for these signs are written in the Bible. Oh, many us have so little faith. Christianity isn’t even the oldest religion there are so many others that where around far before the idea of there being just a single god as far as prophecies go well if your vague enough in your writing then you can predict a lot look at nostradamus as for as the oxidized iron or some sort of pollution have to agree with they say they don’t know because there are so many possibilities to why the river is red and when they do figure it out it won’t be some far fetched sign of the end. It could also be salt deposits that turn the water red. Why do people have to have an answer deemed scientific OR religious? Do you not think that the two go hand in hand? Even as the rainbow is scientifically explained….does that mean that God did not use that symbol as a promise? God is the ultimate scientist….the ultimate magician ….the ultimate healer. We as his children may be catching up in the knowledge of his great glories….that does not take away from what He is or what He does. I too believe what or who we label as God is the greatest scientist ever. What a mind to create and manipulate matter, to assign all things laws and order. And, not everyone believes in God, not everyone believes in the bible as absolute…. so do we look down on them or do we love them? I just don’t believe God has anything to do with how we destroy our world. We destroy Her by choices and so the suffer consequences. This is what I think. I don’t think man made disasters and reactions of a living entity, earth, are part of a war on good and evil. Unless you define Greed and destruction as evil, and good as those who would cultivate our garden Earth. Having a scientific explanation does not exclude God … God is the creator of all things .. And he created a “natural” system. God said these things would happen, He did not say how! My advise to all those that don’t believe, be honest enough to ask God, “if you are there reveal yourself to me”. If you are honest about the request, He will answer. The world is heading to the most chaotic time in human history, God will protect His own .. Be sure that you know beyond a shadow of a doubt that you are not deceived! What evidence do any of you have for what you claim? If this was massive pollution, wouldn’t we be seeing scores of dead fish? The Yangtze River is polluted with 40 million tons of industrial and sewage waste. Half of China’s 20,000 petrochemical factories lie on its banks. About 40 percent of all waste water produced in China—about 25 billion tons—flows into the Yangtze, of which only about 20 percent is treated beforehand. The pollution has taken its toll on aquatic life. Fish catches from the river declined from 427,000 tons in the 1950s to 100,000 tons in the 1990s. The Yangtze is in danger of becoming a “dead river” unable to sustain marine life or providing drinking water. According to report by the Chinese Academy of Sciences released in April 2007 the Yangtze is seriously and largely irreversibly polluted. More than 600 kilometers of its length and almost 30 percent of its major tributaries are in critical condition. Here are the facts plain and simple. Take it or leave it. What were once perceived to be gods, angels and demons could only be described as being such based on the perception of human beings at the time that such beings last arrived here on a global scale on or about 2012 years ago. Call them whatever you wish, but I have the proof. I have tried in every way possible in vein to disclose the truth as to what is really happening for nearly two years now. There has been a massive global cover up going on for quite some time now. We live in a world that is very much as it was portrayed in the movie, “The Matrix”. The wool has been pulled over the eyes of the sheep by the mainstream media, most global governmental institutions and by those agencies and forces that were supposedly put in place to protect us as they have been working in full cooperation with these ultra-terrestrial invaders, otherwise known as the Annunaki for quite some time. The aforementioned are traitors to all of humanity and should be treated as such. As the those who have the knowledge, power and resources are getting ready to run and hide into the false security of their massive underground complexes, the rest of us as well as all other species on the face of this planet are about to be annihilated. I have had thousands of hours of video footage of these creatures, but learned the very hard way each and every time that I have tried to get this footage out there that there are very powerful forces out there who will stop at nothing to keep me from disclosing the truth. All I can say is that I have tried my very best at and at the ultimate cost. My suggestion to everyone else is to enjoy every single moment, spend as much time as possible with those that you love and to hug them all a little tighter. Good luck to all of you. Don’t forget, before you guys go crazy here, that the 3rd Bowl in revelations refers to the rivers turning to blood. Lets not listen to the false prophets out there, okay. God’s wrath is laid out precisely in Revelations. Read it please. The earth does not shake because of god, the earth shakes because of the earths tectonic movement, volcanos do not erupt because of god, they erupt because of pressure built up under the earths surface….i implore the people of this.planet to stop bringing god into everything….he didnt create the earth to micro manage us…if he did we wouldnt have free will….we are directly and indirectly responsible for what is happening. These are just some of the signs and wonders of God…. I believe in christ and I believe he is coming soon.. These events are as they where meant to be…..as it is above it will be below…..we are coming into the age of Aquarius….as we pass the Libra constellation (noted as “scales of justice” within the pyramid’s)…..we pass the “equator” of our galaxy following our solar system’s wave pattern….so our North must become our South….gravitational forces realign our planet as it continues its rotation….these forces re-awaken all existing and dormant volcano’s on our Earths surface….thanks to all the carbon blasted into the atmosphere (necessary) our earth will expand….earthquakes, volcanic activity, hurricanes, tsunami as well as meteorites (when the magnetic fields switch there will be windows of opportunity) are to be the order of the day….we MUST evolve or become another Mars…..expansion of our planet means lower gravitational force and less oxygen…..only the redheaded people’s skin will survive the new solar conditions….acid rain manufactured by all volcanic activity will free the rest…. This appears to be exaggerated journalism, yet again. That’s not a knock on extinctionprotocol, because this site is more like a data hub or relay. I appreciate extinctionprotocol for being an open informational hub. 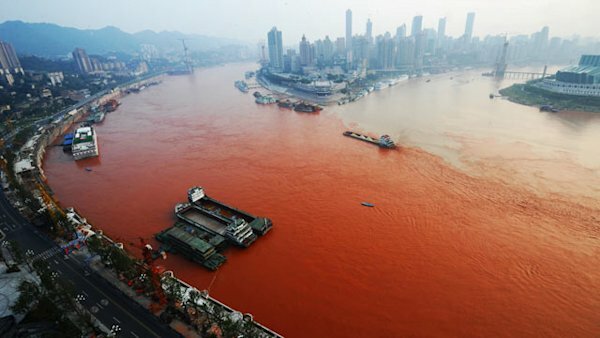 Here is another web link where someone did serious research on this issue of red waters: http://www.rchoetzlein.com/theory/2012/yangtze-explained/ What appears to be going on is mining pollution, and subsequent photoshopping of the river pictures to accentuate the colors. Read for yourself, but remember journalistic integrity is faltering at the moment, so remember that only the scientific method can prove a fact. It’s not god, it’s pollution. A scientist tested the red rain that fell in india and said they were red blood cells in the rain water but had no DNA. I have seen pictures of red water running off of white ice glaciers and there is no iron in these glaciers. It is surely blood because Almighty Jesus word is truth.